Today we celebrate one of my favourite things in the world – it’s Paperback Book Day. I’m sure all readers of this blog will agree there’s something very special about opening and smelling a new paperback for the first time. At the same time, there’s real magic in finding a well-read, well-travelled paperback copy of a great book at a secondhand dealer – it’s nigh impossible not to buy it and take it home with you. A stack of paperbacks to warm a chilly winter’s evening – pure bliss! On this day in 1935 the first Penguin paperback was published in Great Britain. Before Penguin paperbacks appeared, you essentially had only three reading options – expensive hardcover books, library books, or inferior quality (both in production and content) paperbacks. Penquin paperbacks were the brainchild of Sir Allen Lane who, after visiting Agatha Christie, found himself at the train station facing a bookstall containing only magazines and low quality Victorian paperbacks. 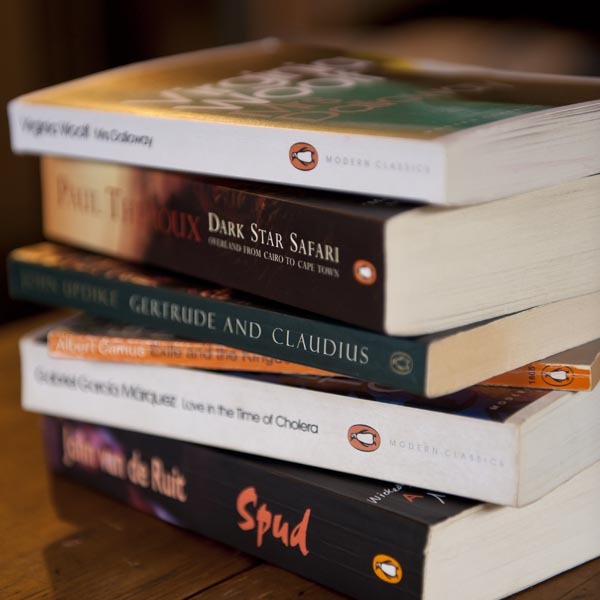 Deciding this was not acceptable, and that good, contemporary books should be more readily available and affordable, he started a new publishing company, which became Penguin books. Early Penguin titles included works by Agatha Christie and Ernest Hemingway. The books were colour coded – orange for fiction, blue for biography and green for crime. They sold for the price of a pack of cigarettes (sixpence), and started a publishing revolution – a staggering 3 million paperbacks were sold in the first 12 months. Despite the massive growth in digital publishing, e-books and e-readers, and a corresponding decline in hardcover sales, the paperback market still appears fairly healthy, with many active participating publishers, including Picador, Faber & Faber, Vintage, Dover, HarperCollins, and many more. Only recently, EL James’ ‘Fifty Shades of Grey’ broke all previous paperback sales records, amazingly passing the one million sales mark in only 11 weeks (the previous record, Dan Brown’s ‘Da Vinci Code’ took 35 weeks to reach the same sales). Of course the appearance of quality paperbacks not only implied increased access to good fiction – academic titles also became more accessible, covering a wide range of fields from art to zoology, mathematics to medicine. The importance of paperback books in the worldwide distribution of knowledge and information can hardly be overstated. Go on, grab a book and get lost in a world of imagination and knowledge – on paperback. As Bernard Shaw once said, ‘If a book is any good, the cheaper the better’.